Airborne angels, billowing clouds, and golden rays against a sky fashioned from rare lapis lazuli surround a receptacle for holy water with exuberantly leaping edges. The Roman master goldsmith who created this stoup inscribed his maker's mark on the central silver relief of Saint John the Baptist preaching in a landscape. Asymmetrically framed by gilded curving segments adorned with feathers, fronds, and flowers, the stoup vaunts the splendors of late baroque sculpture and decorative arts. Its surviving tooled leather case displays the arms of Luigi Braschi Onesti (1745 – 1816), Duke of Nemi and the nephew and adoptive son of Pope Pius VI. The duke perhaps carried it with him between his Rome and Nemi palaces. Possibly Luigi Braschi Onesti, duke of Nemi [1745-1816], Rome and Nemi. private collection; acquired by Barbara Piasecka Johnson [1937-2013], London, by 1989; (her sale, Sotheby's, London, 8 July 2009, no. 31); (Galerie J. Kugel, Paris); purchased 26 October 2012 by NGA. The holy-water stoup was purchased with its original gold-tooled octagonal leather case, to which was added the Braschi coat-of-arms as duke of Nemi. Braschi, the nephew and adoptive son of Pope Pius VI, was given the title in 1786. Józef Grabski, ed. Opus Sacrum: catalogue of the exhibition from the collection of Barbara Piasecka Johnson, exh. cat., Royal Castle, Warsaw. Vienna, 1990: no. 78, 379-381. Opus Sacrum. From the collection of Barbara Piasecka Johnson, Royal Castle, Warsaw, 1990, no. 78. González Palacios, Alvar. Il gusto dei principi : arte di corte del XVII e del XVIII secolo. 2 vols. Milan, 1993: 1:301-302; 2:250-251, figs. 501-502. Levkoff, Mary. 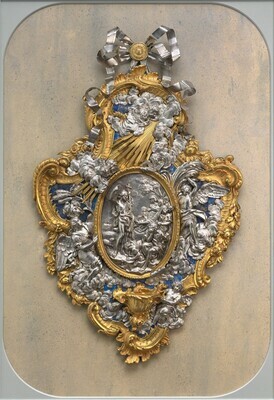 “Giovanni Antonio Fornari, Holy-Water Stoup.” National Gallery of Art Bulletin 48 (Spring 2013): 26-27, repro. "Art for the Nation: The Story of the Patrons' Permanent Fund." National Gallery of Art Bulletin, no. 53 (Fall 2015):31, repro.